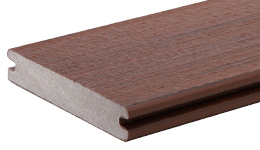 TimberTech's Capped Composite Deck Boards are the same high quality composite as their regular (non-capped) Deck Boards, but are wrapped on all four sides with a super tough polymer engineered to resist fading, scratches and stains. Brilliant! 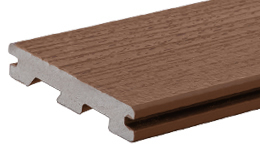 This shell provides TimberTech's Capped Composite Boards with ALL the advantages of their Non-capped Composite Boards, as listed at left just below, PLUS the additional advantages listed on the right. for hidden fasteners or with plain edges. Actual dimensions are 0.94" thick x 5.36" wide. Spans a maximum of 16" on-center joist spacing. NOTE: The Railing Systems, Fascia/Rim Joist Covers, Step Risers, and Deck Lighting shown in the photos are also TimberTech®. These items, plus TimberTech® Fasteners and End Coating will be offered at our website as soon as time permits. Meanwhile, please inquire. The Legacy® Collection has the appearance of high quality hand-scraped hardwood flooring! Seeing is believing. 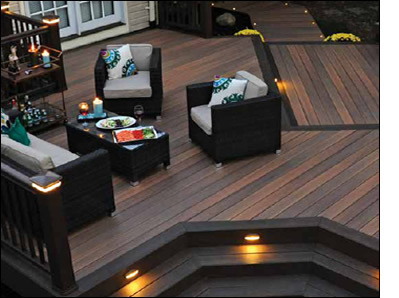 Order samples to experience the ultimate in outdoor decking. You'll be amazed! Variegated streaking creates the grain patterns of exotic tropical hardwoods without cutting a single rain forest tree! Natural tones of brick, brownstone, and slate compliment any architectural style, while blending beautifully with your landscape. The least expensive Collection, but with the timeless appeal of earthy tones. Scalloped bottom side, as seen in photo below at right, saves material and thus cost, but still spans 16" on-center joist spacing. Ends are easily hidden with either Fascia or Riser, something you would probably want to do anyway for a more finished appearance. FREE cut-to-length service! Please note in Comments at Checkout where along the length of your Deck Boards you wish us to cut. 1. Lengths shorter than 12' in Grooved-edge or 16' in Plain Edge are not returnable unless defective.